We’d love your help. Let us know what’s wrong with this preview of Five Ingredient Cookbook by Hannie P. Scott. Your Problems Have Been Solved ==> 5 INGREDIENTS OR LESS! 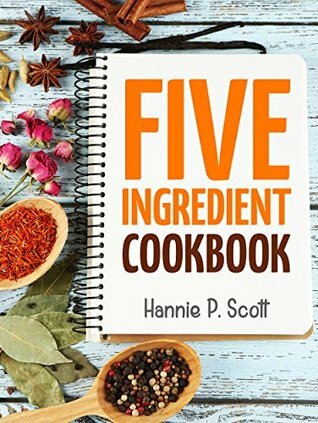 Hannie P. Scott is a best-selling author that knows a thing or two about cooking! Cooking and experimenting with foods is her life passion. To ask other readers questions about Five Ingredient Cookbook, please sign up. I work with special needs students that could make most of these recipes if they had simple step by step instructions. Is there any way that it could be modified for our life skills students? Regrettably I'm not impressed with this recipe book. I like to have photos that show me the end product at least and there's none in here. Recipes looks easy enough even my husband could pull these off without a mistake. I can't wait to try them. It was a good recipe book to flip through for new ideas but unfortunately, it's not my style. I'm more into healthier foods than these recipes offer. This is a great book for someone just starting out with cooking, say college student or recent graduate. The recipes are easy to read, easy to prepare and utilize easy to obtain ingredient. A good majority of the recipes do call for preprocessed items (ie cake mix) to keep the recipes under 5 ingredient. I was able to take away from new ideas from this book. But this is more of a beginner book. Gee, what can I say: I enjoy reading cookbooks because I can read them and not gain any weight, while seeing what the recipes look like when done. Mrs. Scott s recipes are too dog gone good to pick any that are either the cat s meow, or so atrocious that you never want to ever eat them again. Does any chef or cook ever make really bad food? Now I likely will while learning how to duplicate her technique.. This is exactly what I have been looking for after becoming a new wife and mom!! Great food on a budget ! I am so impressed by the creativity and yet the simplicity! You have made my day, night, and time in the kitchen so much better! I will continue to support ! This should be a gift to new wives and moms! Plus it’s an affordable and helpful gift ! Nicely written cookbook. I bookmarked several easy, fast-prep recipes to try. I'm especially excited to try the slow cooker bread pudding recipe as well as the easy powdered sugar donuts. I actually thought I had downloaded a chicken recipe book by accident at first. It seems like the majority of the recipes are involve chicken. Also seems like cheating if one of the five ingredients are something premade. I think my favorite part was the recipe for scrambled eggs. lolz. I like the idea of 5 ingredient recipes and found myself book marking many recipes. And the all seem very easy and not very time consuming. Most recipes keep to the five ingredient rule by using various premade items, like bottled dressings and sauces. Great for a beginner basic cook. Meh.... Neither really bad nor really good. Too many over sweetened recipes as well as using too many processed and American products that are not available in Australia. A great addition for the cooker's library collection as the recipes are mostly short, easy to comprehend and the ingredients are quite common yet cheap enough for those who are on a budgeted grocery list. The mixture of dishes are mostly lunches and/or dinners with some breakfast items and desserts with a bunch of nice slow cooker recipes added. There were a few things that I found to my disliking. First of all this book seemed to share the same recipes as a book that was by Hannah Abedi so I A great addition for the cooker's library collection as the recipes are mostly short, easy to comprehend and the ingredients are quite common yet cheap enough for those who are on a budgeted grocery list. The mixture of dishes are mostly lunches and/or dinners with some breakfast items and desserts with a bunch of nice slow cooker recipes added. There were a few things that I found to my disliking. First of all this book seemed to share the same recipes as a book that was by Hannah Abedi so I don't know if one or the other got inspiration either from each other or the same source. Hopefully since the recipe(s) showed up in both books it is a good one and a keeper so I will be giving it a try. Also like the other author's work this particular book didn't break it down or organize the recipes to make it easier for the reader. Although the majority were grouped in similar fashion unlike Hannah Abedi's book where it seemed to be more or less random at times it still makes it to be a bit on the disorganized side.